And yet this is the war that “gave”—in the words of American Odyssey—California, Nevada, Utah, Arizona, New Mexico, and part of Colorado to the United States of America. And the Treaty of Guadalupe Hidalgo, formally ending the war, ratified the annexation of Texas, which had broken away from Mexico largely because of Mexico’s policies against slavery. Exactly. President James K. Polk, himself a slaveowner, had ordered U.S. troops into an area claimed by Mexico and inhabited by Mexicans and waited for them to be attacked. And when they were, Polk claimed aggression and the U.S. had its war. The invading U.S. Army actually called itself the Army of Occupation. I have not seen the full Mexican American Studies curriculum, although I know it includes important texts like Rodolfo Acuña’s classic Occupied America and Paulo Freire’s A Pedagogy of the Oppressed—a book studied in every teacher education program worthy of the name. But I’m wondering how one can teach about the history of the U.S. relationship with Mexico in a manner that is not “emotionally charged.” You want to talk about “bias”? What about the bias of a textbook that can “cover” a war like that waged against Mexico in two paragraphs, or four paragraphs, and fail to so much as quote a Mexican, an abolitionist, a soldier, a woman, an African American, or a Native American—or fail to describe the death or injury of a single human being? What about the bias of a textbook or an entire curriculum that can discuss invasion and war in a manner that is not “emotionally charged”? The problem with the school curriculum in this country is that it is not emotionally charged enough. Poverty rates are skyrocketing—especially for children of color. People are losing their homes because of the criminal behavior of huge financial institutions—and race has a lot to do with who profits and who suffers. This country’s military is still being sent to invade and occupy—and murder people with silent, invisible drones. The rich and powerful poison our atmosphere, our water, our food, and our children. So, yes, let’s have a curriculum that gets emotional—and that tells a fuller truth than is offered in our textbooks. And let’s stand in solidarity with the teachers and students in Tucson who are demanding to teach and learn about things that matter. Reprinted from the Rethinking Schools Blog, Dec. 29, 2011. © Rethinking Schools. 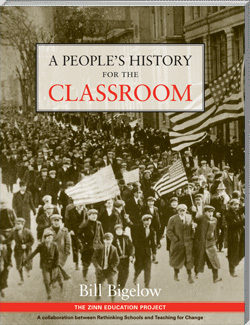 The Zinn Education Project, a project of Rethinking Schools and Teaching for Change. Teaching Guide. By Bill Bigelow. 2006. 160 pages. 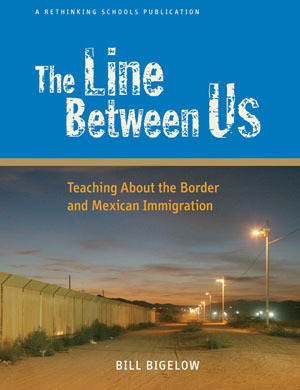 Lessons for teaching about the history of U.S.–Mexico relations and current border and immigration issues. Teaching Guide. By Bill Bigelow. 2008. Lessons to introduce students to a more accurate, complex, and engaging understanding of U.S. history than is found in traditional textbooks and curricula. Published by Rethinking Schools.